The agreement will enable the provision of food, fuel and military supplies between Japan's Self-Defense Forces (SDF) and French and Canadian armies. Japan has also inked ACSAs with the US, UK, Australia and India. Why did Japan sign such an agreement? This has laid the foundation for Japan to broaden its SDF military activities and ensure military provision with its partners. It is a small-scale bilateral military alliance system centered on Japan. This shows Japan's long-term strategic plan　. Since the 21st century, Japan has clearly labeled China as its biggest real and potential rival. Especially since Shinzo Abe took office, he spared no efforts containing China. During Abe's first term, the Japanese government raised the idea of the "arc of freedom and prosperity." When he became Prime Minister for a second time, the policies advocated by his cabinet, including the values-based alliance, the alliance of maritime democracies, the democratic security diamond and the freedom corridor, have all kept China in focus. Because of the ACSAs with Australia and India, Japan can militarily constrain China's Belt and Road initiative in the Pacific and Indian Ocean regions. In the Atlantic, it can also exert forceful intervention in China's policy in Europe, North Africa and West Africa. In some areas where China's military strength has not reached, Japan has crafted its military plan in advance by utilizing its bilateral alliance system, trap-falling China's military strategy into a passive position. Japan's ambition is to become a global political power. 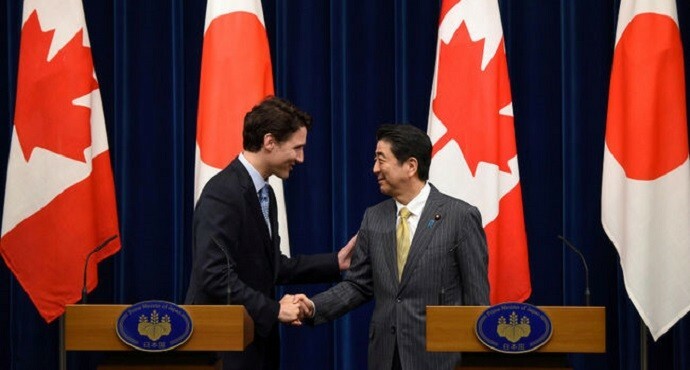 But political and diplomatic means alone cannot support Japan's global ambitions. A military presence at the global level is needed if Japan is to expand its political clout. Compared with old European powers like the UK and France, Japan's military influence in Europe is jerkwater. But it is different after Japan signed military pacts with these countries - Japan's political influence is increasing because of the support of military powers. With the influence of the UK and France declining in the Asia-Pacific region, their military activities can get the support from Japan via the ACSA, which will immensely boost Japan's military clout. These European countries will not look down on Japan through the military lens, which will effectively strengthen Japan's political might. Meanwhile, exchanges of military provisions will help enhance people-to-people exchanges between Japan and these countries, exerting Japan's cultural influence in these countries and beyond. Even if Japan fails to become a permanent member of the UN Security Council, it can still play a major role in the world. This has been part of the global strategies of the Abe administration. We can see that Japan signing ACSAs with six countries is not just for defense and military purposes, it's part of an overall plan to influence economics, politics, military and culture, which is a long-term strategic mindset of the Japanese government.